Since winning best functional training gym in the UK at last years National Fitness Awards, we have been inundated with questions about how to join and what gym memberships we offer. 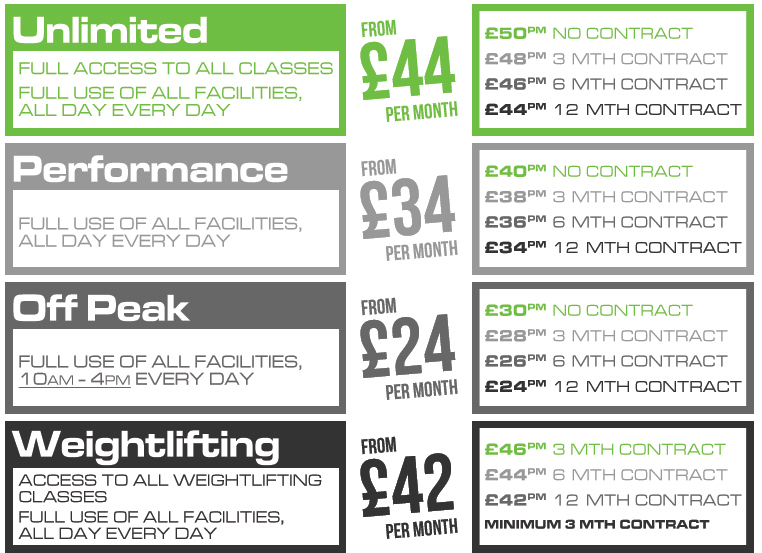 So… here is everything you need to know about gym memberships at Rigs Fitness here in Birmingham. The easiest way to join Rigs Fitness is with a monthly Direct Debit gym membership. Saving you the trouble of setting up a standing order or having to find the cash each month, we simply get you to sign up in house with us or online and the rest is done for you. With all our Direct Debit memberships* we give you 4 options: No Contract, 3 Month, 6 Month or 12 Month – giving you the chance to decide whether you want the freedom to be able to freeze or cancel whenever you like or bring your monthly gym membership cost down with a longer term contract. All of our gym memberships include access to our personal training services, expert advice whenever you need is and NO JOINING FEE. Don’t want to pay by Direct Debit? No problem at all. We have two offers for anybody who wants to pay using card or cash. Both are up front payments and work out cheaper than paying via Direct Debit. Pay for 6 months up front, get 1 month free. When you pay for any of our no contract gym memberships up front for 6 months we will give you 1 month completely free. This means a 15% total saving on your gym membership. Pay for 12 months up front, get 3 months free. When you pay for any of our no contract gym memberships up front for 12 months we will give you 3 months free. This means a 20% gym total saving on your gym membership. If you want to sign up today and pay for your gym membership up front get in touch and we will respond ASAP with further details. Email (ask@rigsfitness.co.uk) or call us (01212461976) today. Student – If you are a student and have a valid NUS card then you can get 15% off your gym membership at Rigs Fitness. Simply use the promocode: STUDENT when signing up online or in house with us and you will claim your discount gym membership. Emergency Services – If you work in the emergency services and have valid proof of employment you can get 15% off your gym membership at Rigs Fitness. Simply use the promocode: EMERGENCY when signing up online or in house with us and you will claim your discount gym membership. Independent Birmingham – If you have a valid Independent Birmingham card then you will receive your first months membership free when signing up online at Rigs Fitness. Simply use the promocode: INDYBRUM when signing up online to claim your discount gym membership.